FILE - U.S. aircraft carrier USS Carl Vinson arrives for an annual joint military exercise called "Foal Eagle" between South Korea and U.S, at the port of Busan, South Korea, March 15, 2017. 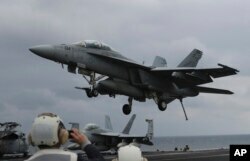 As an American Navy aircraft carrier group heads toward Korea, China said Thursday that military force alone cannot end tensions on the Korean Peninsula. At the same time, an influential Chinese newspaper urged North Korea to stop its nuclear program in exchange for Chinese protection. Experts are worried that the North could soon conduct its sixth nuclear test or launch more missiles in defiance of United Nations resolutions and sanctions. The United States has also strongly warned that it will no longer be patient with the North. China is the North’s only major ally. It also gives a lot of aid to the country. But it wants the North to end its nuclear weapons program. China has called for negotiations to ease tensions. It also wants nuclear weapons removed from the peninsula. The Global Times newspaper, which is published by the Communist party’s People’s Daily, called on North Korea and its leader Kim Jong Un to stop developing nuclear weapons. “As soon as North Korea complies with China’s declared advice and suspends nuclear activities, China will actively work to protect the security of a denuclearized North Korean nation and regime,” it wrote recently. Sources told VOA that the USS Carl Vinson aircraft carrier group includes the USS Ohio submarine, which is armed with 154 Tomahawk cruise missiles. Just last week, the U.S. fired 59 missiles at a Syrian airfield in response to a deadly gas attack. A U.S. Navy's F/A-18 Super Hornet fighter approaches the deck of the Nimitz-class aircraft carrier USS Carl Vinson during the annual joint military exercise between South Korea and the United States, March 14, 2017. U.S. President Donald Trump has said he will not accept any military aggression from North Korea. But American officials say the administration wants to use stronger economic sanctions against the North, not weapons. U.S. officials said the president was considering an oil embargo, banning North Korea’s airline, intercepting cargo ships and punishing Chinese banks that work with North Korean companies and the government. “There’s a whole host of things that are possible, all the way up to what’s essentially a trade quarantine on North Korea,” an official told Reuters. From Seoul, South Korean Foreign Minister Yun Byung-se told parliament that he believes the US will tell his country before it attacks the North. On Thursday morning, a spokesman for the Joint Chiefs of Staff said South Korea has no evidence that military aggression from the North will happen soon. The United States has about 28,500 troops in South Korea. Japanese Prime Minister Shinzo Abe also said on Thursday that North Korea may be able to fire missiles that have sarin nerve gas. A senior Japanese diplomat said the United States was putting “maximum pressure” on North Korea to ease tensions while also pressuring China to influence its ally. South Korean officials said there were no new signs showing a nuclear test by the North was likely. But they said the North appeared ready to conduct a test at any time. 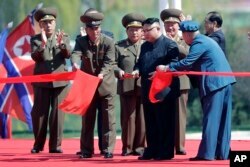 North Korean leader Kim Jong Un, fourth right, stands with officials as he cuts the ribbon at the official opening of the Ryomyong high-rise district, Thursday, April 13, 2017, in Pyongyang, North Korea. Pictures taken by satellites show a North Korean nuclear site is being prepared for what would be the country’s sixth nuclear test. North Korea marks the “Day of the Sun” on Saturday, April 15th. It is the 105th birth anniversary of its founder, Kim Il Sung. The North often makes large displays of its military strength on this day. U.S. government sources said that North Korea appears to have a placed a device in a tunnel at the site that could be detonated Saturday or even sooner. “We have no comment but we will be watching closely,” an official at the National Security Council told VOA. The Reuters news agency and VOA Correspondent Steve Herman reported this story. Christopher Jones-Cruise adapted the reports for Learning English. Hai Do was the editor. armada – n. a large group of ships, boats, etc. aggression – n. hostile action against another country, government, etc. tunnel – n. a passage that goes under the ground, through a hill, etc.